The press release for this book reads “Tyson covers all the major concepts in astrophysics, and does so in an accessible but never condescending style.” It is indeed true that the major concepts are described, but the style is often all-too-condescending, the jokey, I'm-a-hip-dad voice of an adult speaking patronizingly to a kid. Unfortunately, those poetic moments are outweighed by the jokes about not wanting to meet a black hole on the street and the awkward comparisons of quarks to “those kids who never want to do anything alone, not even walk to the restroom.” The “simple recipe for matter in the universe” where you stir together quarks and leptons is a wasted page, not geared to any reader, young or old. The book has value, however, in pointing out how scientists work, how they ask questions, how they don't know all the answers. He describes Einstein's work clearly and gives credit where it's due to Vera Rubin, the scientist who proved the existence of dark matter. If only the writing were all on that level instead of serious science salted with lumpy comparisons in an effort to make the information more digestible. No third grader will make sense of this book, and no seventh grader will have patience with the hokey tone. 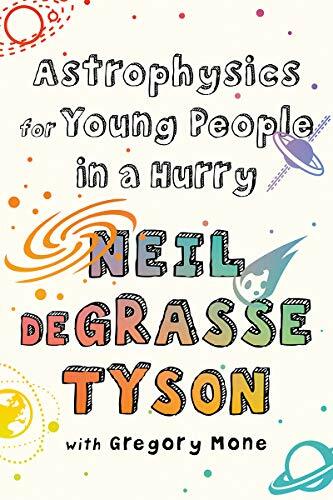 If Tyson had trusted his audience with more intelligence, he could have written a compelling book for 10–13 year olds. Instead, in trying to reach younger readers, he ends up reaching very few: those readers who are so eager for the information, they're willing to skim over the heavy-handed jokes about cows on Titan. This is a shame because the way he writes about cosmic thinking, about having a cosmic perspective, is important. But it comes at the end of the book, long after many readers will have stopped turning the pages.